Maia is having the worst day ever. From her shocked expression in the trailer for Shadowhunters Season 3 Episode 7, she just came face-to-face with the last person she ever wanted to see again. Awkward! We know little about Maia's past, except for that she's from New Jersey and she got infected by her boyfriend with the werewolf curse. He disappeared and she stopped trusting people. That moment was what drove her to New York City. Though, it seems he might be coming back into her life. Simon's new roommate Kyle looks to be the mysterious ex-boyfriend. Based on the trailer, we see a quick flashback memory of Maia and Kyle kissing in a car together. Maia's hair is much longer in the scene, so that moment had to have happened years before ever meeting Simon. From the look on her face, and Kyle's face, neither had planned to see each other any time soon. 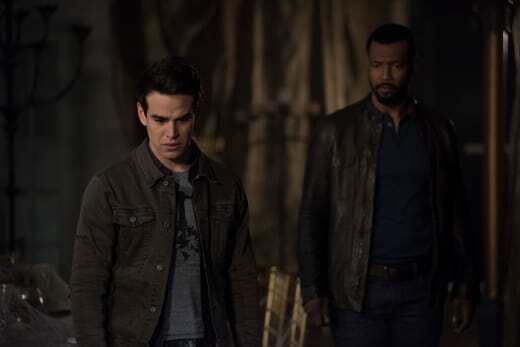 Even Kyle, who is all-knowing and a member of the Praetor Lupus, didn't plan on reuniting with his ex. She looks blown away and devastated over his return. Will this cause more trouble for Maia's relationship? Will these two bury the hatchet? 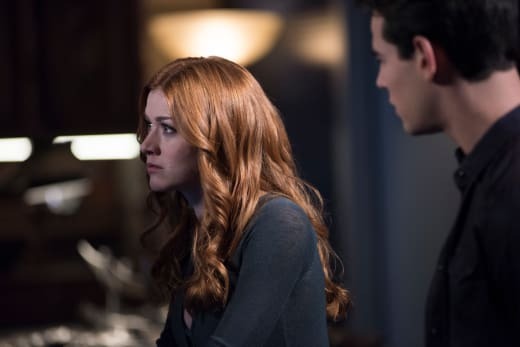 Speaking of reunions, Clary and Jace are having an uncomfortable meeting. Now that it's been revealed he's the owl demon, all she wants to do is save her boyfriend. We see Clary trying to reason with Jace and remind him of their love for each other. Her tactic obviously fails as he proclaims that he doesn't love her at all and he throws her off a roof. Will she survive the fall? Check out the full teaser below and share your thoughts in the comments! Don't forget, you can watch Shadowhunters online via TV Fanatic to get caught up on all the past action. 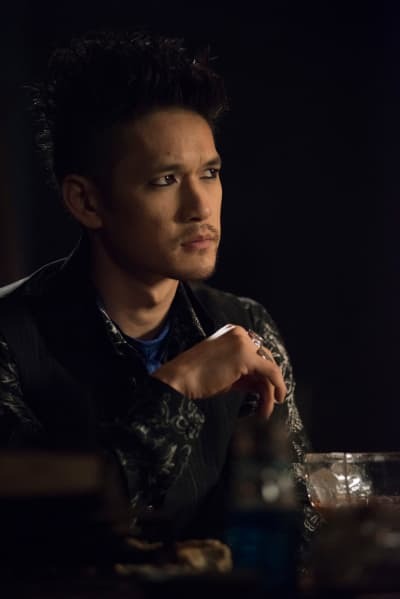 Shadowhunters Season 3 Episode 7: "Salt In The Wound"
Alec: Magnus, Lilith would’ve gotten to him with or without you. You can’t put this all on yourself. Magnus: I will fix it. I will use the last drop of my power if it’s the death of me. Alec: No, I was wrong. I said things I shouldn’t have. Magnus: As did I. But that’s not important right now. What’s important is saving your parabathai. Permalink: No, I was wrong. I said things I shouldn’t have. Clary: Jace, this isn’t you! Clary: Jace, I know you’re still in there. I know you won’t kill me. Jace, I love you. Jace: I don’t love you. Not anymore. Permalink: I don’t love you. Not anymore.